Udhayanidhi gets candid in an interview with Behindwoods Air in the show Madai Thirandhu. He is a star speaker for DMK. When asking if he faced any pressure, he said he has campaigned for DMK from the beginning and it wasn't new for him. He also said that his first campaign turned out to be a success. He also clarified how his statement about Thamizhachi Thangapandiyan was misinterpreted and passed a snide remark about how BJP and co excelled at Photoshop and that is how they twisted it. When asked about his remarks on Anbumani Ramadoss, he said he only mentioned what he told and he didn't add anything new. He also said how Anbumani degraded the CM a month ago and is now in the same coalition. He wondered how they travel in the same campaign van after all this. When asked about Kamal's MNM and calling it a B-team, he said while it is a good thing he started a party to do public service, he asked what was he doing in the past 50 years when there was corruption and why he is blaming DMK, a party that wasn't in power for the past 7 years, for corruption. When asked by the anchor, Gabriel, about his debut into politics, the actor said it has been going on and on ever since, and he is going to concentrate on what he does. When asked if he was willing to contest in elections if the party demands, he said he is not ready yet and there are more deserving candidates out there. He also spoke about how Modi was disliked throughout the state and how people are aware of EPS and OPS being a slave to the PM. No longer, his spot to campaign arrived and his energy and reception were noteworthy. He continued answering the anchor's questions after the campaign. When they were about to end the interview, the van was pulled over as police approached. Police wished him and bid adieu and Udhayanidhi was friendly and polite with them. You can watch the entire interview here. 'செல்ஃபி எடுக்க முயற்சித்த தொண்டர்'...'அன்புமணியின் ரியாக்‌ஷன்'...வைரலாகும் வீடியோ! 'யாருமே ஓட்டு கேட்டு வர்ல!'... ஒவ்வொரு வாக்கும் முக்கியமாக இருக்கும்போது இப்படி ஒரு கிராமமா? தி.மு.க.வைப் பார்த்து கமல் ஏன் எரிச்சலாகிறார்?.. போட்டுடைத்த உதயநிதி ஸ்டாலின்! ‘தேர்தல் டியூட்டி பயிற்சி’ வகுப்பின்போது நெஞ்சுவலியால் ஆசிரியைக்கு நேர்ந்த பரிதாபம்! அனைத்துக் கட்சி வேட்பாளர்களுக்கும் பிடித்த ஃபேவரைட் குடும்பம் இதுதான்.. ஏன் தெரியுமா? தேர்தல் 2019: முதல் ஓட்டுப் போட்டது யார்? எந்த மாநிலத்தில் பதிவானது தெரியுமா? அட இதை கண்டு அச்சப்படும் அரசியல் கட்சிகள்! ஏன் தெரியுமா? ‘கூட்ட நெரிசலில் படுகாயமடைந்த புகைப்படக் கலைஞர்’.. களத்தில் இறங்கிய ராகுல் காந்தி.. வைரலாகும் வீடியோ! This page contains news relating to various facts and events. The views are generally about current affiars and general topics in diversified areas such as political, international, national, and regional issues, sports, health, travel, lifestyle, technology and business. People having similar interets on the above topics will find this page useful. 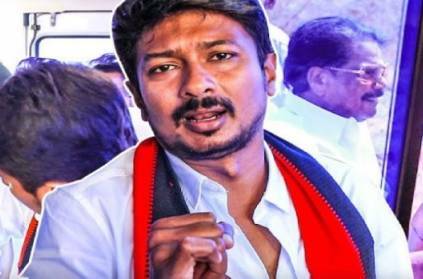 Police entry in middle of Udhayanidhi Stalin interview Ch | Tamil Nadu News.